We would like to thank the following companies and organisations for supporting the work we do enabling us to provide life changing aid to thousands of people living in the remote regions of Africa. Inspecs for supplying us with a fantastic range of sunglasses and spectacle frames which will be used in the vision centres to provide eye care to those living in some of the poorest regions of the developing world. Bagport UK Ltd for donating all the unwanted glasses left at Heathrow Airport. This supply has become essential to our project enabling us to help many more people. Wolf Eyewear for supplying us with some great frames. Essilor for supplying us with complex lenses and workshop equipment used in the development of our glazing machine as well as significant financial donations. 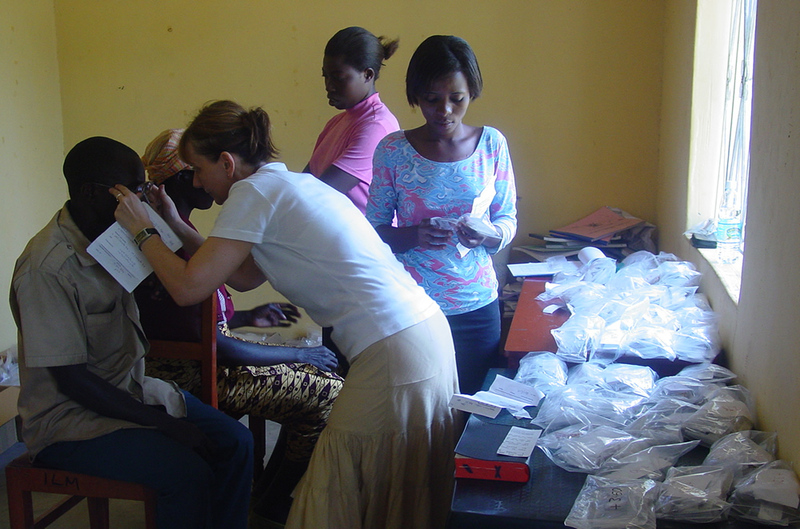 Gary Evans from Eyetech for giving us a large quantity of slit lamps, non contact tonometers, field screeners, focimeters, charts, trial lenses and much more which has enabled us to set up our first vision centres in Nigeria and the DR Congo. Rotary who have backed us from the beginning and will be helping us with the training costs and the development of the glazing machine. Vision Express for donating a huge amount of uncut spectacle lenses enabling us to provide free or affordable eye care services for the poor. We are so grateful for the generosity of these companies and organisations without whom we could not have achieved what we have.